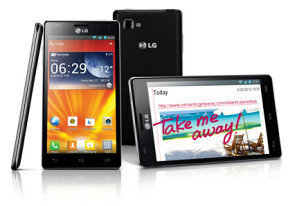 The LG Optimus 4X HD comes with a wide range of connectivity options. It has quad-band GSM/GPRS/EDGE for global roaming and three-band HSDPA with 21 Mbps of download and 5.76 Mbps of upload. Wi-Fi is dual-band with a/b/g/n support, DLNA, Wi-Fi Direct and Hotspot capabilities. There is NFC and Bluetooth 4.0 too. SmartShare is an app that lets you control a DLNA network - you can play media from other devices (e.g. NAS) on your phone or play something from the phone onto another device (e.g. a DLNA-enabled TV). The Wi-Fi Direct is a technology which enables devices to connect to each other without the need for a Wi-Fi hotspot. The beauty of it is in that only one device has to be Wi-Fi Direct-ready for the magic to happen. Using this technology two (or up to eight) devices can share files in a more advanced, fast and secure way, paving the road to an eventual Bluetooth demise. NFC is also on board in the form of a dedicated app called LG Tag+. From there you can create, read and send NFC tags. With NFC you can share contacts, URLs, memos, messages, calendar events or even a call request to another NFC-enabled device or a tag. You can also store information, a profile preset or some action in a blank tag and then use it to make the phone perform an action every time you touch it - for instance launch a SatNav app when you touch the in-car tag or change your ringing profile when you touch your designated tag at the office. The last connectivity option worth noting is the 3.5mm audio jack on top of the Optimus 4X. The user interface is completely minimalist (it's the Google way). All you get on the screen is an address bar on top and a control bar at the bottom (with options hidden by default). The address bar is placed on top of the page, so scrolling down moves it out of view. The bottom control bar houses the back and forward keys, zoom shortcut, and the new window and bookmarks keys. We recommend turning off the auto-hide option, since the placement of the capacitive home key makes it almost impossible to hit the pop-up shortcut without accidentally tapping onto the home key area. The browser offers the ability to save a cached copy of any page you're currently browsing onto your phone. If you choose a website and go to 'save for offline reading', you can then open it from the Saved section of your bookmarks, even when you're no longer connected to the internet. This is great for long articles, as you can save them for those times when you don't have web access. The Optimus 4X HD supports double tap zoom and pinch zoom. There's text reflow too - it adjusts the columns of text to fit the screen width. If you've pinched to zoom in, you need to double tap the screen to make the browser reflow the text. Find on page, always request desktop site and brightness options are available from the advanced menu. If you tap and hold on some text you get the usual markers and select/copy/find/web search/share options. The bookmark list shows a thumbnail of the bookmarked page and you also get a history section in addition to the Saved pages list. The powerful quad-core hardware enables the Optimus 4X HD browser to play 1080p Flash video without a hitch. That was truly impressive stuff considering a lot of netbooks would choke on something like that. You can play touch-optimized Flash without breaking a sweat too. The Optimus 4X HD comes with the usual set of organizing apps and there's a preloaded document viewer and editor. The app in question is Polaris Office and it's one of the most advanced mobile editors we've seen. You can of course view documents - Word, Excel and PowerPoint documents and PDF files too. Edit mode offers almost a full set of options - text style, justification, paragraph formatting, bullets, even creating tables. If you're editing an Excel file, you get a formula wizard, resize rows/columns, border style, merge cells and so on. Even creating a full PowerPoint presentation is possible. The app also doubles as a file manager and integrates with Box.net. The calendar app has been completely renewed. The screen estate has been split into two parts - one for the calendar and one for the agenda/daily/weekly view. This way you will always have your monthly view visible. The border line between the two sections is not fixed and you can easily move it. You can hide the monthly view completely, but you can't do the same with the other section. In case you want to enjoy the calendar in full screen without any additional views, just turn the phone landscape. Adding a new event is quick and easy, and you can also set an alarm to act as a reminder. You can also view events from three different calendars: your phone, your email and Google groups. The LG Optimus 4X HD features an alarm clock application, which allows a lot of alarms to be set, each with its own start and repeat time. The Timer, World Clock and Stopwatch features are also part of this app. The organizer package also includes a useful voice recorder and a nicely touch-optimized calculator. The Memo app allows you to take notes and add media to them, such as images, audio, or location. The so-called QuickMemo function is integrated in the phone's OS, allowing you to capture screen shots of anything (including the lockscreen!) and scribble notes over them like you would on the Galaxy Note - and of course the LG Optimus Vu. A simultaneous press of the up and down buttons of the volume rocker will take the screen shot. There are also weather, news and finance apps. There are no dedicated Facebook, Twitter or MySpace apps preinstalled. Luckily, the Social+ widget is here, along with the Facebook and Twitter contact sync. Once properly configured, the Social+ widget will show your Facebook news feed and Twitter updates, the latest Twitter mentions and your social messages. The gallery has Social+ integration so you can easily share photos onto Facebook and Twitter. The Optimus 4X HD does come with the Google+ and Messenger apps. Google+ lets you view trending profiles, as well as feeds from all your circles, while the messenger app lets you quickly chat with any of your Google+ contacts. Of course, while they do not come with the phone, you can always download the official Facebook and Twitter apps from the app marketplace. The Google Play app market, previously known as the Android Market, lets you download various apps for your device. Upon launch of the Market app you're greeted with the tiled interface of the Featured window. A swipe to the right takes you to the Categories view. Swiping to the left takes you through Top Paid, Top Free, Top Grossing, Top New Paid, Top New Free and Trending (the ones with growing popularity). New sections are available such as Staff Picks, Editor's Choice and more. Downloads are easy and won't take more than a couple of seconds. Before you agree to download an app, the Market will show you what features the app requires access to (e.g. Internet connectivity, access to the file system, etc.). You can also see if updates are available for your currently installed apps by going to My Apps in the contextual menu. The LG SmartWorld app store is also on board. It's similar to the SamsungApps market - there you can find lots of free content and promotions exclusive for LG users. The LG Optimus 4X HD managed to get a GPS lock in about two minutes without A-GPS. A-GPS can speed up the lock (but it involves data traffic). Cell-ID and Wi-Fi positioning are also available if all you need is a rough location, but they need a data connection too. Google Maps is a standard part of the Android package and we've covered it many times before. It offers voice-guided navigation in certain countries and falls back to a list of instructions elsewhere. You can plan routes, search for nearby POI and go into the always cool Street View. The latest version uses vector maps, which are very data efficient and easy to cache. The app now lets you cache maps and will reroute you if you get off course, even without a data connection. 3D buildings are shown for some of the bigger cities and you can use two-finger camera tilt and rotate to get a better view of the area.